NOTICE: For vehicles equipped with VSC, if wheel alignment has been adjusted, and if suspension or underbody components have been removed/installed or replaced, be sure to perform the following initialization procedure in order for the system to function normally: 1. Disconnect the negative battery terminal for more than 2 seconds. 2. Reconnect the negative battery terminal. 3. Perform zero point calibration of the yaw rate and acceleration sensor and test mode inspection. (a) Bounce the vehicle at the corners up and down to stabilize the suspension and inspect the vehicle height. HINT: If the vehicle height is not as specified, adjust it by pushing down or lifting the body. HINT: If the toe-in is not within the specified value, adjust it at the rack ends. 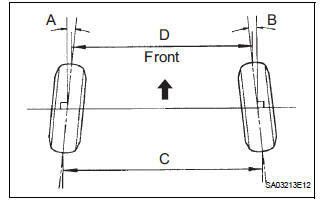 (c) Turn the right and left rack ends by an equal amount to adjust the toe-in. HINT: Adjust the toe-in to the center of the specified value as much as possible. Torque: 74 N*m (755 kgf*cm, 55 ft.*lbf) (f) Place the boots on the seats and install the clips. 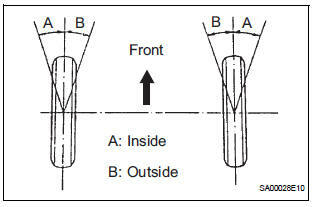 (a) Turn the steering wheel fully and measure the turning angle. 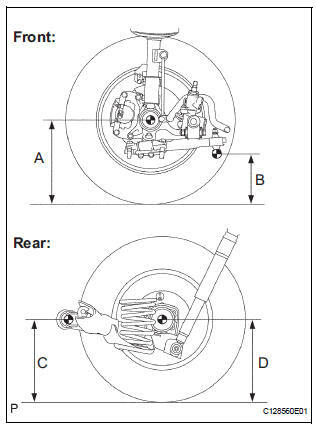 HINT: If the right and left inside wheel angles are not as specified, check the right and left rack end lengths. 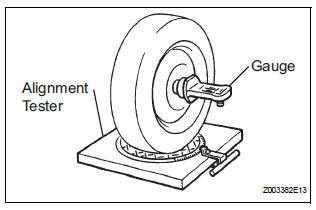 (a) Install the camber-caster-kingpin gauge or position the vehicle on the wheel alignment tester. HINT: If the caster and steering axis inclination are not within the specified values, after the camber has been correctly adjusted, recheck the suspension parts for damaged and worn out parts. NOTICE: After the camber has been adjusted, inspect the toein. NOTICE: When removing the nut, hold the bolt not to rotate. (c) Clean the installation surfaces of the shock absorber and the steering knuckle. (e) Adjust the camber by pushing or pulling the lower side of the shock absorber in the direction in which the camber adjustment is required. NOTICE: When installing the nut, stop the bolt from rotating and tighten the nut. Torque: 103 N*m (1050 kgf*cm, 76 ft.*lbf) (h) Check the camber. Adjust the camber to the center of the specified value as much as possible. Adjusting value for the set bolts is 6' to 30' (0.1° to 0.5°). 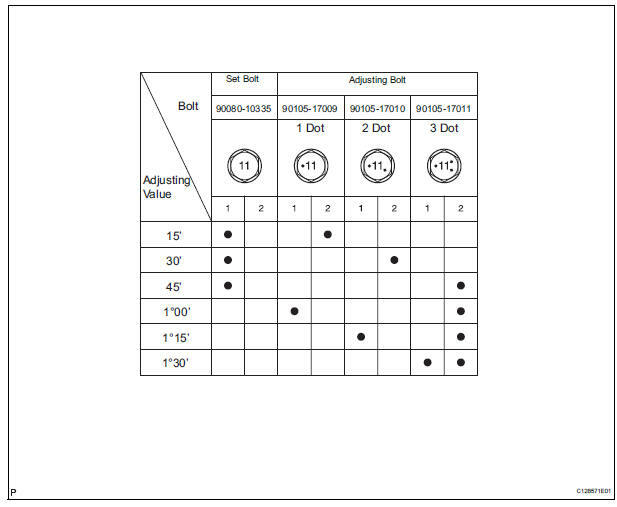 If the camber is not within the specified value, using the following table, estimate how much additional camber adjustment will be required, and select the camber adjusting bolt. NOTICE: Tighten the adjusting bolt with a washer and a new nut. (i) Perform the procedure mentioned above again. At procedure "B", replace 1 or 2 selected bolts.